The following is the final summary report of Mars Desert Research Station (MDRS) Crew 177 (Lone Star Highlanders). 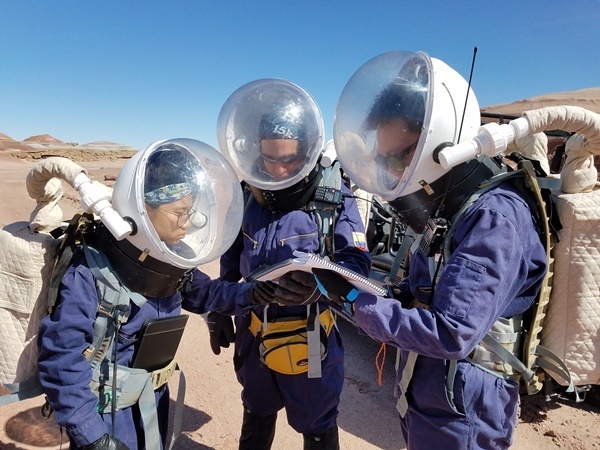 A full review of this year's activities at MDRS will be presented at the 20th Annual International Mars Society Convention, scheduled for September 7-10, 2017 at the University of California Irvine. A call for abstracts for the convention was issued recently, with a June 30th deadline. Crew 177, Lone Star Highlanders, a team representing McLennan Community College, from Waco-Texas, stationed at Mars Dessert Research Station, MDRS, from March 26th until April 1st, for a one-week rotation as a part of McLennan Community College Mars 101 program with the main goal of providing an introduction to analog field research and training in all aspects of MDRS sim. The team consisted of eight participants, six students conducting independent projects, and two faculty members serving a Commander and Co-Commander. Projects conducted by students were engineering and biology related. Pitchayapa Jingjit is a freshman at McLennan Community College. She is planning to transfer to a four-year institution to pursue a degree in science in hope to attend a medical school. Her research project is trying to find bacteria producing antibiotics in order to combat the antibiotic resistance crisis. She collected soil samples containing bacteria from different point of interest around the Mars Desert Research Station and bring those samples back to McLennan Community College in Waco, Texas to begin the laboratory work. Furthermore, she conducted a microbiology EVA to find the presence of Gram negative enteric bacteria and Gram positive staph bacteria in the HAB and the Green HAB. As expected, she found both Gram positive and negative bacteria in both the HAB and the Green HAB. Caleb Li is a sophomore year student of McLennan Community College, majoring in Electrical Engineering. He was planning to design a LED digital clock that put on the air lock to optimize the crew member’s experience while waiting to go out to do EVA. He was using the FPGAs on the Basys 2 Board to implement the clock function, time counting function, and alarm system. On Sol 4 he installed the clock in the air lock. The afternoon EVA crew used his posted instructions to operate the LED clock when they returned to the hab. He will continue working on the alarm system and more advanced functions back to the school. Elijah Espinoza is a freshman Mechanical Engineering student at McLennan. He is at MDRS working on a robot with Victoria LaBarre. His part of the robot is an arm that is attached to the robot that can pick up various objects such as rocks. The robot is in the early stages of a long project that will eventually be able to go out on its own and rescue an astronaut that is hurt. It is designed to be a rescue ambulance called the Emergency Medical Service Rover (EMSR). He is using a Vex competition kit to power the arm. On SOL 5 he and Victoria went out to the Cow Patty Field and tested the robot to observe how it moved on the terrain and how it picked up different sized rocks. The robot Elijah and Victoria are working on is a progression from Victoria’s project last year. Elijah plans to continue to work on the project when they get back to McLennan. Victoria LaBarre is a sophomore student at McLennan Community College, majoring in electrical engineering. This is her second time coming to MDRS. On her first trip in 2016, she tested prototype one of the Emergency Medical Service Rover (EMSR) and conducted two human driver tests. When fully realized, the EMSR will be able to automatically go out into the field and retrieve an injured astronaut to bring them back to the Hab. This year, 2017, prototype two was developed and tested at Mars by LaBarre and her partner Elijah Espinoza. LaBarre worked on the drive train and the programming of the robot. The robot’s strength and dexterity were tested in Cow Patty field by picking up different sized rocks, which were then brought back to the Hab to be measured. Esteban Ramirez is a first-year student at McLennan Community College majoring in Biomedical Engineering. His project dealt with energy concerns a Mars exploration would have. The amount of available energy to a crew or device is what gives them the ability to carry out their jobs on any space expedition. His project tested the feasibility and consequences of providing a bike generator for a Martian exploration to increase efficiency and health of the crew. Once arriving at MDRS various tests were done on the generator bike to calibrate and fix problems with the battery. Multiple tests on crew mates were done and data was collected such as voltage created, time spent, and calories used. These data will be analyzed and aggregated to find correlations between efficiency and various other variables such as height, weight, and age. Conclusions will be presented at McLennan Community College on Scholar Day. Joseph Quaas is a freshman computer science student who came to MDRS in order to develop a virtual reality simulation of the MDRS site. The simulation is to consist of a basic rescue operation consisting of the user learning the location of a person, who is need of assistance, driving the rover to their location, and bringing them back to the hab. There were some developmental problems during the week concerning the implementation of certain 3D models and scripting, but good progress was still made on the project. The entire premise of virtual reality, especially a sim based upon a real-life location, is to immerse the user in a virtual environment that is as close to the real-life version as possible. During his time at MDRS, he saw and got the feel of many locations around MDRS and made adjustments to the landscape in the sim in order to make the sim more accurate. Becky Parker is a Marketing Professor at McLennan Community College. Her project is preparation of a marketing plan for recruiting student and faculty participants for future Mars missions as well as other travel course. She used her time at Mars to take photos and videos of the mission to be used in marketing materials, and to conduct interviews with each participant. She led a brainstorming session in order to get student input for the plan. Dr. Otsmar Villarroel, chemistry professor at McLennan Community College, served as the crew 177 commander. He enjoyed her second rotation at MDRS designing the every day’s activities during crew’s mission. He also led planned EVAs for Orientation, Geology, Chemistry and independent projects. We would like to thank the Mars Society and McLennan Community College for allowing us being part of this invaluable experience. We are deeply thankful for the opportunity.